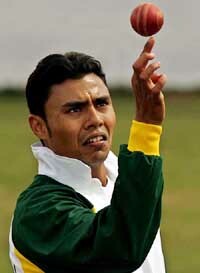 Pakistani Leg Spinner Bowler Danish Kaneria was arrested yesterday in United Kingdom for the charges of doing Match Fixing in county cricket. Later on he was left on bail until 25 May and was told to stay in UK. There are charges against Danish Kaneria that he done match fixing in Essex's Pro40 match in September last year. another Cricketer of Essex is also charges for Match fixing. Investigation against both the players are continuing. This is not the first time a Pakistani player is blamed for Match fixing in this year but many Pakistani Cricketer where also blamed for match fixing during Australia Tour.